Cook pork on medium heat until completely cooked. Add oyster sauce, scallions, and cornstarch and stir to coat. Place a small teaspoon full of meat into the center of the won ton. Fold it in half, creating a triangle. Moisten the edges with water and then press to seal. Pull each side corner of won ton downward. Set won tons aside. 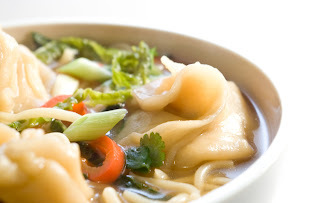 You can also make this soup quickly by adding frozen already assembled pot stickers. Conversation Starter: Make up a fortune cookie fortune for the person on your right.